The geometric mean only applies for positive numbers. So, when using investment returns, the geometric mean is calculated using the decimal multiplier equivalent values. For example, a 6% return is 1.06, and a -4% return is 0.96. For a large series of returns that is normally distributed, the geometric mean is approximately equal to the arithmetic mean minus half of the variance. So, even though the arithmetic mean return for the two investments is the same, the realized final value depends on the volatility. Which Mean Should We Use for Investment Returns? When thinking about investment returns, both the arithmetic mean and the geometric mean are useful. The arithmetic return is the most familiar measure of the mean, and it is also the most commonly used metric in many statistical models such as the CAPM. However, it is not correct to compound the arithmetic mean to calculate the return realized over multiple periods. Whenever we are compounding returns, the geometric mean must be used. It would be incorrect, and would substantially overstate the final value, if we used the arithmetic mean of 10% in this calculation. With leveraged ETFs, an investor earns 2X or 3X the daily returns of the target index (less fees and borrowing costs), so the daily arithmetic mean of the 2X ETF is 2X the daily arithmetic mean of the target index, and the daily arithmetic mean of the 3X ETF is 3X the daily arithmetic mean of the target index. However, since the daily variance is also increased, the daily geometric means do not go up by the same 2X or 3X factor. If we use our approximation equation from above, we can estimate the geometric return for the target index and for the 2X and 3X leveraged ETFs. Since our equation for estimating the geometric mean from the arithmetic mean and standard deviation is only an approximation (and our daily return data is a “fat tailed” distribution), it is a good idea to check the approximation equation against the empirical data. In the plot below, I’ve used the actual daily returns of the U.S. market (based on the CRSP daily market return data) from 1964 through 2010. For each year in the sample, I’ve calculated the daily arithmetic and geometric means, and I’ve also calculated the geometric and arithmetic means after doubling and tripling the daily returns. The individual points on the plot show the difference between the geometric and arithmetic means vs. the daily standard deviation over each year. The lines in the plot are based on the approximation equation. Note that the curves match up very well with the empirical data and validate our approximation equation. 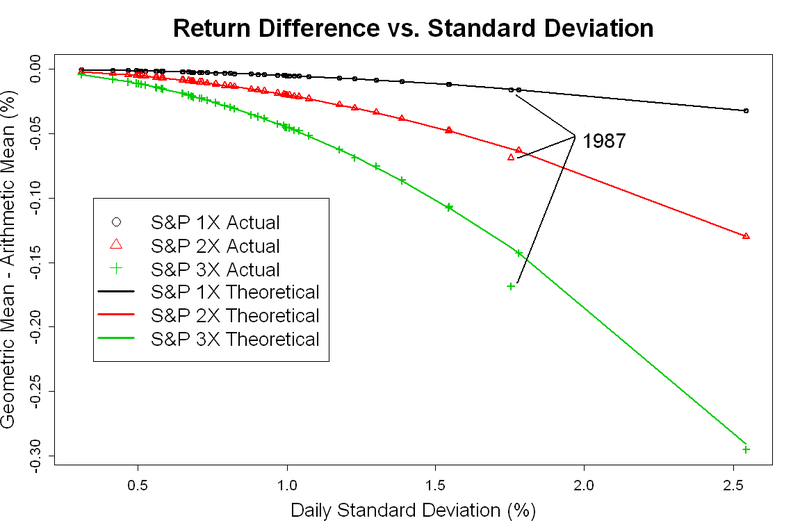 Interestingly, the empirical data points that show a large error relative to our approximation equation are based on the return averages for 1987…which, of course, had one huge down day (October 19th or Black Monday) which was many standard deviations from the mean daily return. Since the difference between the actual arithmetic and geometric mean returns match up very well with the approximation equation, we can use this equation to generate a reasonable prediction of what will happen under various volatility scenarios. The arithmetic mean of the daily return over the full range of our data (1964-2010) is about 0.04% per day. 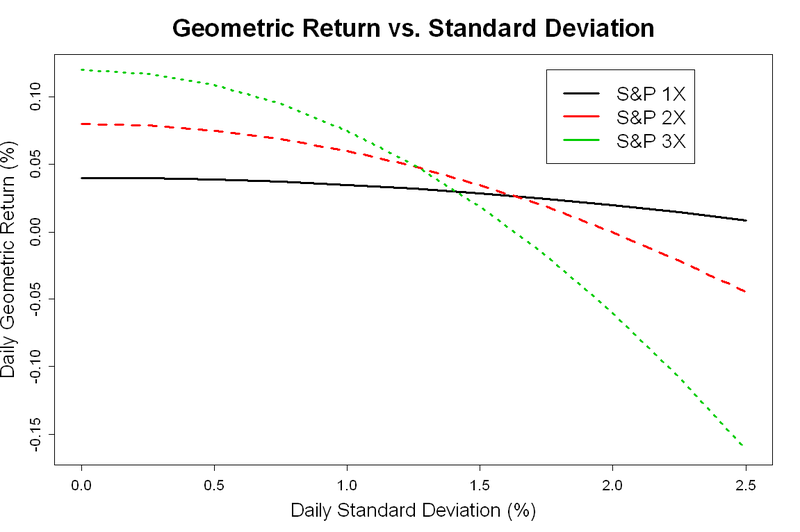 The plot below shows how the geometric means vary with standard deviation for this “typical” level of daily return. This plot shows that although the leveraged ETFs can outperform under some scenarios, they will do relatively poorly when volatility is high. The crossover points will occur at lower volatilities in years when the daily returns have an arithmetic mean of less than 0.04%, and they will occur at higher volatilities in years when the arithmetic mean is higher. Of course, the leveraged funds will always underperform for years with negative arithmetic mean. Also, if we consider the borrowing costs, the leveraged ETFs will do even worse. As the final graph shows, leveraged ETFs have some undesirable characteristics which investors should take the time to understand before investing in these funds. It is a common misconception that these funds will return 2X or 3X the index returns over the long term, and, as the analysis shows, they are certain to fall short of this level of return. In fact, there is a strong possibility that they will return even less than the the underlying target index. If you feel you are capable of predicting short term market moves (good luck! ), these funds may be an appropriate tool. However, they are probably not a good choice for the long term investor. Daily CRSP market return data can be found at the Kenneth French data library. Excellent analysis! I’ll refer to the math in a post on FAS-FAZ relationship. Hi Jev, Thanks for visiting my site. Your Quantum Blog site looks very interesting as well. I’ll try out some of the Matlab code. This is really excellent analysis. Have you considered how leveraged inverse ETFs perform in relation to volatility? If you follow Chang and Mandhavan’s (2009) analysis it would suggest that a -3x ETF has a higher expected decay than a 3x ETF as their exponential decay expression has a term -(x^2-x)*sigma^2. The triple bull S&P 500 (UPRO) is up 159.1% from inception (25 Jun 09) to 9 Feb 2012. Over the same period, the S&P 500 is up 46.9%. Therefore the triple bull has returned considerably more than 3 times the S&P 500 price return. I believe this is because the effective leverage rises in a bull market, magnifying the returns. The UPRO significantly underperformed a perfect triple (exp(ln(s&p)*3)), but if you were bullish, you were very happy with this return. I know I am. Note this leveraging factor works both ways. The UPRO significantly underperformed the S&P*3 during last years selloff. To mimic a true triple leveraged investment, you would continually sell some upro over a bull market otherwise your original capital investment would become too highly leveraged. As you gradually withdrew funds in a bull market, your original capital would be returned and therefore not at risk, while you would continue to participate in the upside. When a big selloff occurs, you would buy more upro at the lower price with the cash you have withdrawn and play the game again. A very interesting option to consider. Oops, the upro is based on total return, not price. Bloomberg adjusts upro price history for this payout. So the correct comparison is with the S&P 500 total return index. The cumulative total return of the s&p 500 (25 jun 2009 to 9 feb 2012) is 55.04%. The cumulative total return of holding upro over the same time frame is 159.11%. Three times the S&P return is 165.12%, so the upro lagged the target by 6% or about 2% a year, corresponding to ‘fees and expenses’. The choice of time interval is important. If the market is down or only up modestly over the given interval, the upro will more significantly lag the target of 3 times the S&P 500 total return.